In 2014, we examined "How Many Data Scientists are out there?" and came with an estimate of 50-100,000, and did not see much evidence of a massive shortage then. In 2014, we found only about 1,000 job ads for "Data Scientist" on indeed.com. In 2016, we examined Deloitte study that predicted Businesses Will Need One Million Data Scientists by 2018. Is there a shortage of Data Scientists now? How many "Data Scientists" are there , both in name and in function ? What are the future prospects for Data Scientists? 1. Is there a shortage of Data Scientists? The answer to the first question appears to be yes. Demand for data scientists is off the charts ... data science skills shortages are present in almost every large U.S. city. Nationally, we have a shortage of 151,717 people with data science skills, with particularly acute shortages in New York City (34,032 people), the San Francisco Bay Area (31,798 people), and Los Angeles (12,251 people). Note that LinkedIn reports shortages for people with "Data Science Skills", not necessarily people with "Data Scientist" title. We can estimate the demand for "Data Scientists" from two popular job search sites - indeed and Glassdoor. Search on indeed.com for “data scientist” (in quotes) in USA finds only about 4,800 jobs. Note: using quotes are important for searches on indeed. Search for data scientist without quotes finds about 30,000 jobs, but we are not sure how many of those jobs are for scientists in other areas. Glassdoor search for "Data Scientist" finds about 26000 jobs in USA (same results if quotes are removed). 2. How many "Data Scientists" are there? Kaggle (now part of Google) is a platform for data science and analytics competitions. It claims to be the world’s largest community of active data scientists. While not all Data Scientists take part in Kaggle competitions or have a Kaggle account, and not all Kagglers do work of data science, it is reasonable to assume a large overlap. In June 2017, the Kaggle community crossed 1 million members, and Kaggle email on Sep 19, 2018 says they surpassed 2 million members in August 2018. Since not all Kaggle members are active, Kaggle membership is probably a global upper bound for people engaged in data science. KDnuggets is now reaching over 500,000 unique visitors per month, and given our focus on helping Data Scientists and Machine Learning Engineers to do their job better, we think it is also a reasonable estimate that the majority of our visitors work in Data Science / Machine Learning area, regardless of their job title. While visitors may stumble on KDnuggets randomly, we can look at subscribers / followers - a more active subset. KDnuggets now has about 240,000 subscribers/followers over Twitter, LinkedIn, Facebook, RSS, and email, and while there is some overlap, about 200,000 seems a reasonable low bound for a number of Data Scientists globally. Examining the titles of members, we see great diversity. The titles include Data Scientist, Data Analyst , Statistician, Bioinformatician, Neuroscientist, Marketing executive, Computer scientist, etc... It is safe to say that any person who does the tasks that a conventional data scientist does can be considered in this category. With the growing need to analyze data to derive insights or make key decisions, people with traditionally different job titles and responsibilities are keen to learn new techniques of data analysis to suit their domains. This doesn’t make them a data scientist primarily but they do possess that knowledge and talent of the field. We can also get useful information from LinkedIn profile of Data Scientists, which shows over 100,000 people with this title. Fig. 1: LinkedIn Data Scientist profile, by industry and by location. We can also estimate the size of larger data analysis/visualization/statistics community by looking at activities related to languages and platforms most connected to Data Science: R, Python, Machine Learning libraries, Spark, and Jupyter. Apache Spark Meetups had 225K members recently and growing every month. Intel Capital estimated that there 1 million R programmers worldwide. Based on the public data on python.org website, there have been around 2.75 million downloads. Jupyter project has around 3 million users at present. These numbers can give us a rough upper limit on the number of data analysts/data scientists around the world. LinkedIn 2017 emerging jobs report claims that machine learning engineers working today has increased by 9.8 times as compared to 5 years ago. 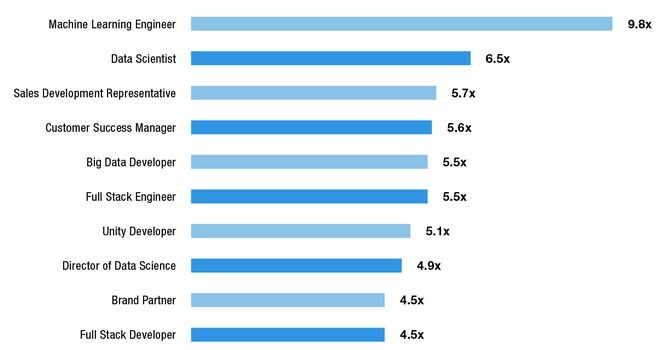 Machine Learning Engineers, Data Scientists, and Big Data Engineers rank among the top emerging jobs on LinkedIn. Data scientist roles have grown over 650% since 2012. Fig. 2: Top 10 emerging jobs on LinkedIn and their growth from 2012 to 2017. Long-term, however, automation will be replacing many jobs in the industry, and Data Scientist job will not be an exception. Already today companies like DataRobot and H2O offer automated solutions to Data Science problems. Respondents to KDnuggets 2015 Poll expected that most expert-level Predictive Analytics/Data Science tasks will be automated by 2025. To stay employed, Data Scientists should focus on developing skills that are harder to automate, like business understanding, explanation, and story telling. 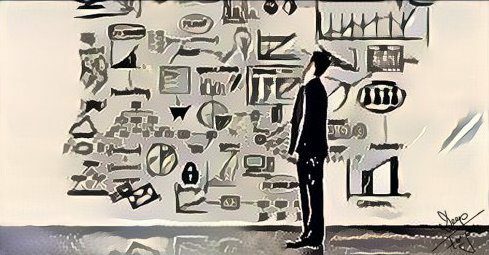 How Many Data Scientists are out there? Data Scientists Automated and Unemployed by 2025?